Zara Maria Larsson (born December 16, 1997) is a Swedish singer. She received national fame for winning the 2008 season of the talent show Talang, the Swedish version of Got Talent. Zara signed with the record label TEN Music Group in 2012 and released her debut EP album Introducing, in January 2013. The single "Uncover" topped the charts in Sweden, Norway, and Denmark. Both the single "Uncover" as well as the album Introducing were certified triple platinum in July 2013 by Universal Music Sweden. Zara also signed a three-year contract with Epic Records in the United States in April 2013. She lives with her mother, father and her younger sister. 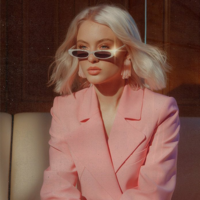 Zara Larsson was born on 16 December 1997 in Stockholm, Sweden. She has one younger sister, Hanna (born 2000). She was a finalist of the Swedish talent show Stjärnskott 2007 before appearing on Talang. She won the competition at age 10, and received the prize money of 500,000 SEK as a result. "My Heart Will Go On" was later released as Larsson's debut single. A video of her performance in the final has received over 14 million views on YouTube. Although very little news was heard for over four years following her Talang victory, Zara signed with TEN Music Group in 2012 to release her debut extended play. The EP's name is Introducing and it was revealed on December 9, 2012 through a preview of her song "Uncover" on YouTube. The album was released on January 21, 2013, featuring five songs. "Uncover" was released as the album's lead single. It later peaked at No. 1 on both the Sverigetopplistan and DigiListan charts, as well as reaching No. 1 in Norway and peaking at No. 3 in Denmark, and by February 25, 2013 the song was certified Platinum in Sweden and watched over 5 million times on YouTube. The song also entered the Svensktoppen tracklists. In July 2013, the song was certified triple platinum in Sweden by Universal Music Sweden. At Sommarkrysset in Gröna Lund in July 2013, she also received a triple platinum award from Universal Music Sweden for her debut EP Introducing, for "sales in excess of 120.000 units in Sweden". On March 27, 2013, Zara's next EP was revealed through a preview of the song "She's Not Me (Pt. 1)". The EP, Allow Me To Reintroduce Myself, was released on July 5, 2013, featuring five songs. However, the double-single "She's Not Me" (consisting of "She's Not Me (Pt. 1)" and "She's Not Me (Pt. 2)"), from the album, was released on June 25, 2013. Zara revealed on her blog on April 3, 2013, that she had signed a three-year contract with Epic Records in the United States (U.S.). Her next single, "Bad Boys", was released on October 28, 2013.